Steak and French fries belong together — which is why we turned the classic French dinner into a genius summer appetizer. Preheat grill to medium-high and preheat oven to 400º. Pound steak to 1/4” thickness, if necessary. Slice steak against the grain, on the diagonal, into thin strips (about 2”-long). Toss steak with olive oil, rosemary, mustard, and Worcestershire. Let marinate for at least 15 minutes and up to 2 hours. Season with salt and pepper when ready to grill. 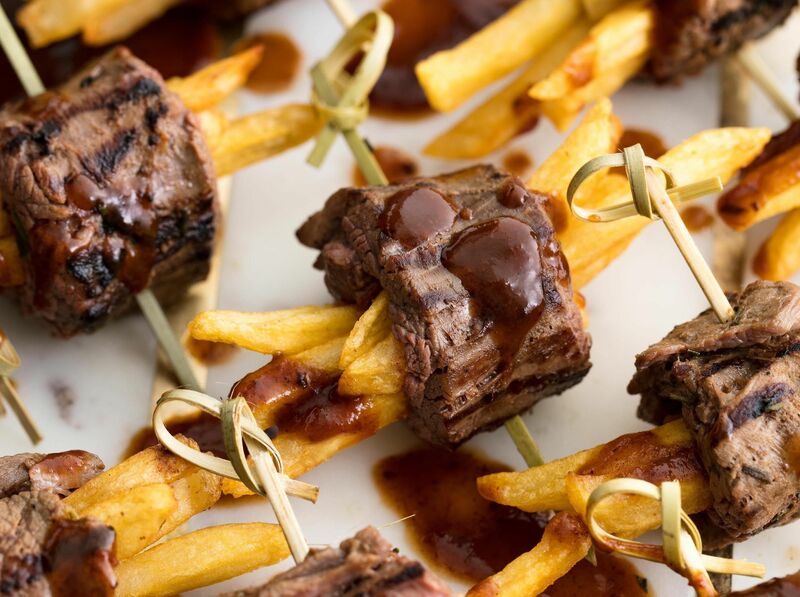 To assemble the steak frites bites, lay out a piece of steak and place a baked fries on top. Roll up and secure with a toothpick. Repeat until all steak and fries are used up. Grill until charred, 2 minutes per side for medium-rare. Transfer to serving platter and drizzle with steak sauce.